Versatility. It’s something that people aspire to. It adds value to your résumé and makes you marketable. But versatile foods are even more valuable to me than versatile people. 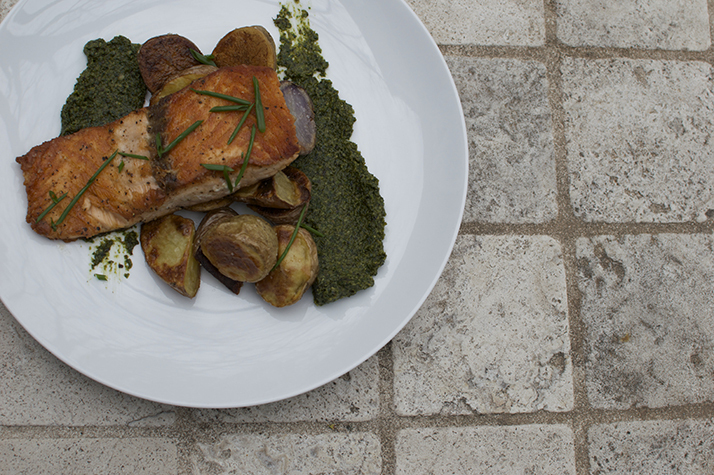 Pesto is the definition of versatility. Nuts + herbs/greens + garlic/onion + oil + cheese (sometimes) + acid. Done. Simple sauce that’s delicious cold, hot or somewhere in between. But I’m going to make a very traditional pesto, just subbing roasted ramps for the garlic. 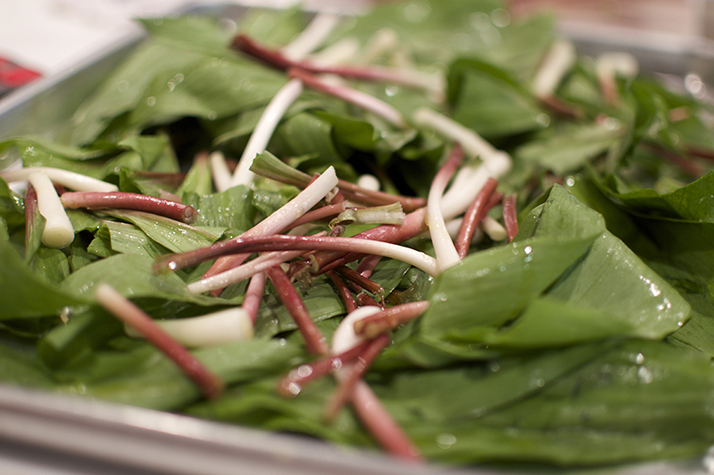 You probably want to roast or blanch the ramps. They’re pretty strong in raw form. Otherwise, just play around. Know what else is versatile? Salmon. And potatoes. And they share a natural affinity for ramps. 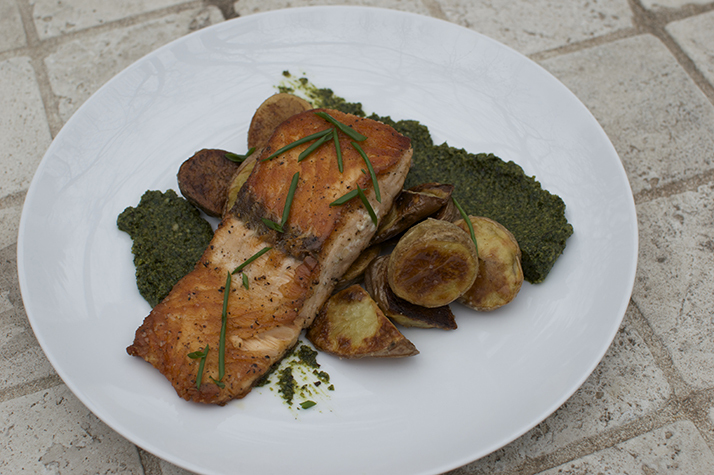 And of course, ramp pesto. 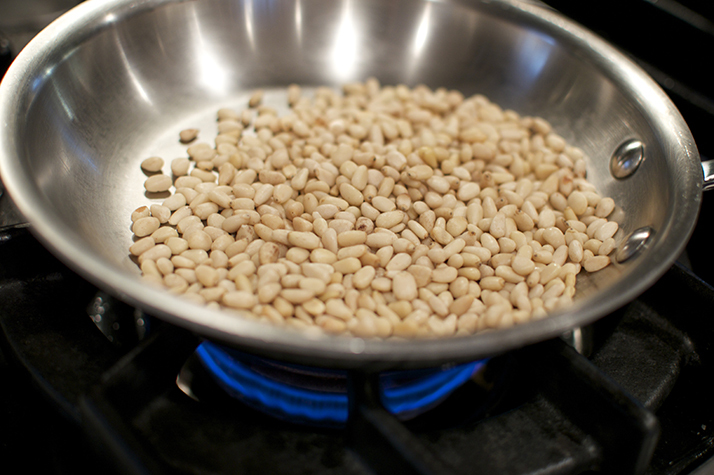 Get the pine nuts toasting over low heat in a small pan. Don’t leave them alone. You’ll burn them. They’re expensive. Just don’t do it. Trust me. You are allowed, if working right next to the toasting pine nuts, to clean the ramps and put them, tossed in a little olive oil, on a sheet pan in a 400 degree oven to wilt for a few minutes. Don’t forget about the pine nuts. Shake the pine nuts. 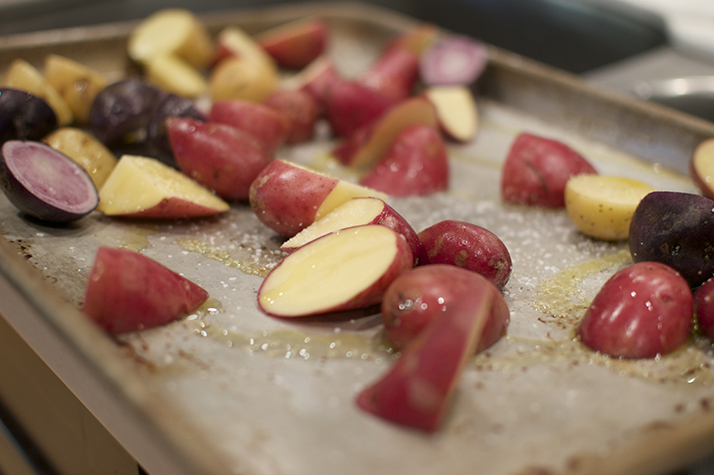 Then, cut the fingerlings into bite-sized chunks, toss in olive oil and salt, put them on their very own sheet pan, and add them to the oven with the ramps. 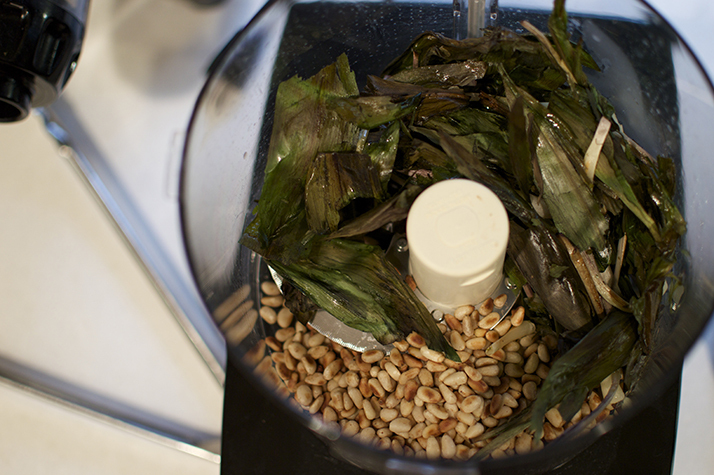 When the pine nuts and the ramps look like the ones in the picture above, add them to the bowl of a food processor. Blitz it up. 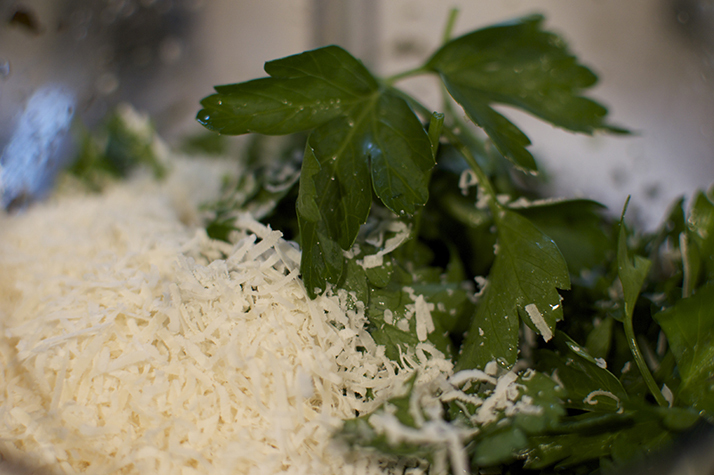 Add the cheese and the parsley. Don’t worry about getting all the leaves off the parsley stems. The stems taste like parsley too. Just chop off the stems where they no longer have leaves and toss the top of the bunch in the processor. 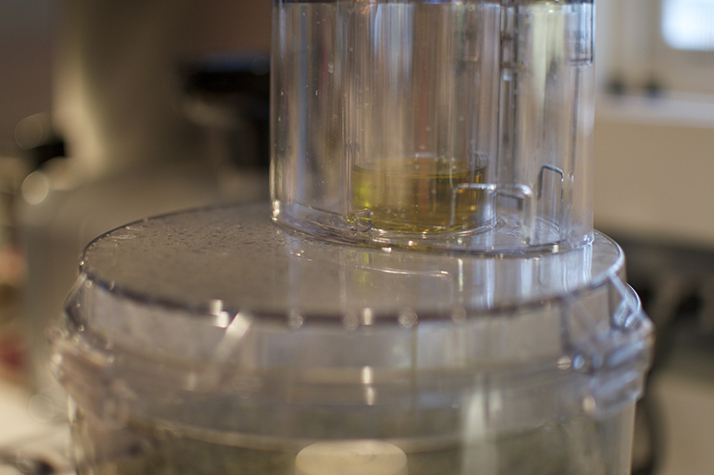 Then add the olive oil to the liquid feeder on top of your processor. Yeah, that’s what that hole is for. It lets liquids slowly trickle into the bowl while the machine runs to help you form that perfect emulsion. This is good for making hollandaise, homemade mayo and really any other emulsion you’d make in a processor. Then add in lemon juice, salt and pepper to taste. Blitz again. You’re done. 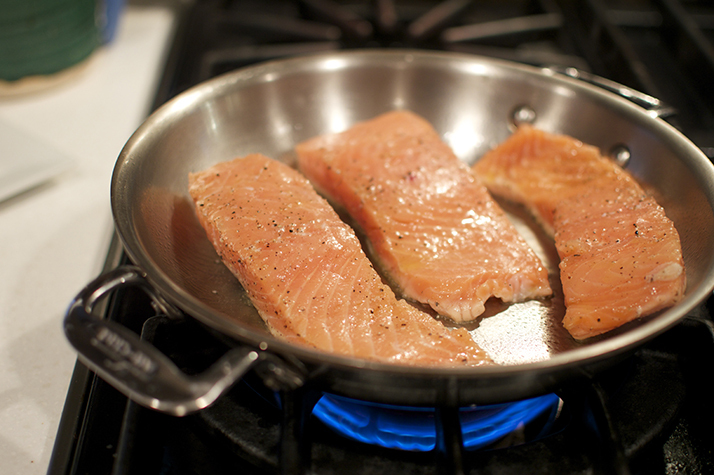 Next, toss your salmon in olive oil, salt and pepper, then place it, pretty side down, in a pan preheated over high heat. 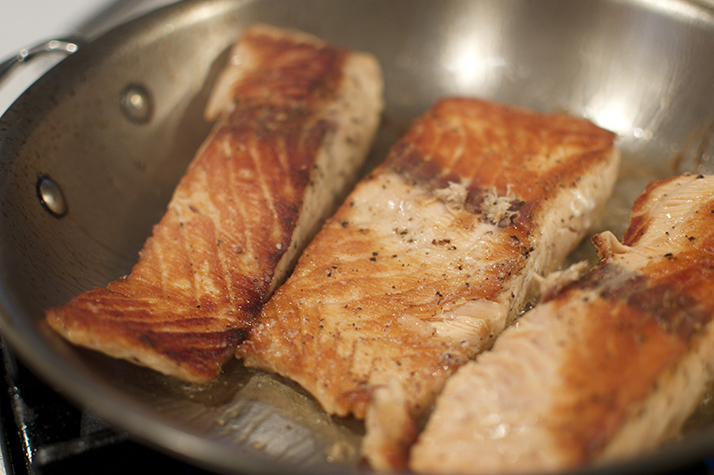 Sear until the salmon browns on first side and is easily turned. Turn, immediately transfer to oven with potatoes and cook to desired doneness, usually about 10 minutes, based on the size of your fish and how done you like it. Top the whole thing with chives if you’d like. And enjoy. Then enjoy thinking about the next kind of super versatile pesto you’ll make, because you can, and it will be awesome.